This class was truly great. It got our entire team thinking in new ways, opening vistas of what we can do & how to do it. I strongly recommend this class. It was exactly what I needed as a newbie to NVDA. Eileen’s deep experience was invaluable. She has truly “been there & done that” and can speak with real insight and can articulate concepts clearly. I want more training from Eileen! ● Choose an issue where you can actually make a difference. ● Identify the people who you want to pressure and where they are vulnerable. ● Develop creative tactics to make your actions effective, press-worthy, and often fun. ● Build your impact over time, so the people you’re trying to pressure have to take you seriously. The most recent round of this course is now closed, and the next is not yet scheduled. Please fill out the form below to get word of my next offering. During the 30 years that I’ve been an activist, I’ve used a variety of tactics, from letter-writing and peace vigils to knocking on doors, but none of them felt adequate to address the challenge of climate change. Eventually I started to despair that nothing I was doing really made a difference. Then six years ago, I found a group that uses nonviolent direct action to work for a just and sustainable economy, Earth Quaker Action Team (EQAT, pronounced “equate”). As I stepped into more edgy action, I learned how to have a real impact, and discovered my own latent leadership gifts. 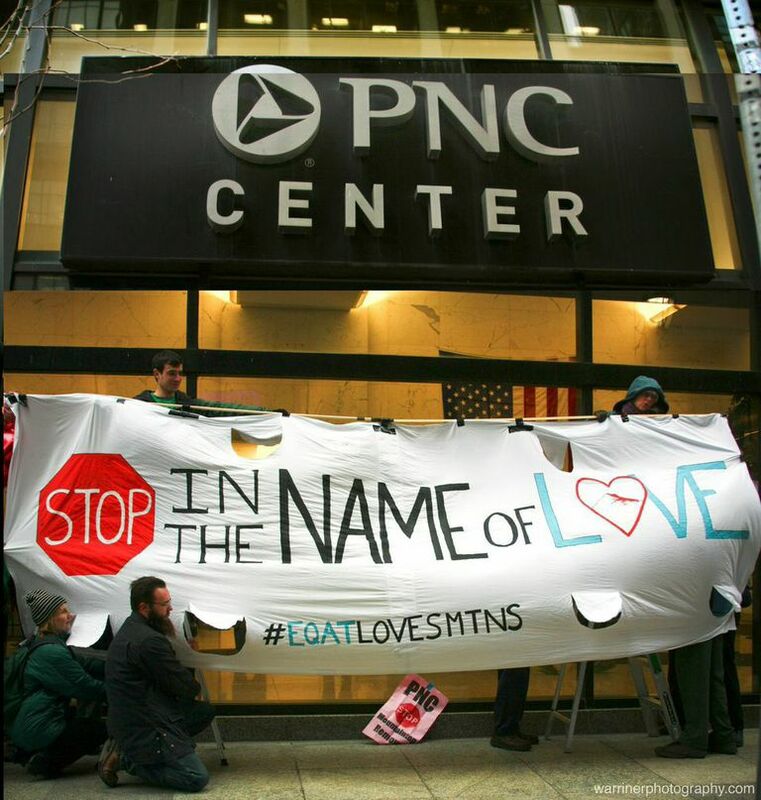 While serving as EQAT’s board chair, I helped to shape our successful strategy to pressure PNC Bank to stop financing mountaintop removal coal mining. 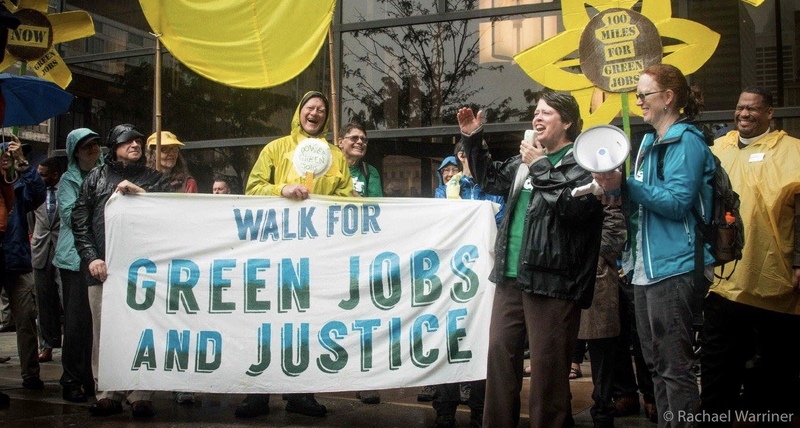 After winning against a $4 billion-a-year bank, we launched the Power Local Green Jobs campaign. 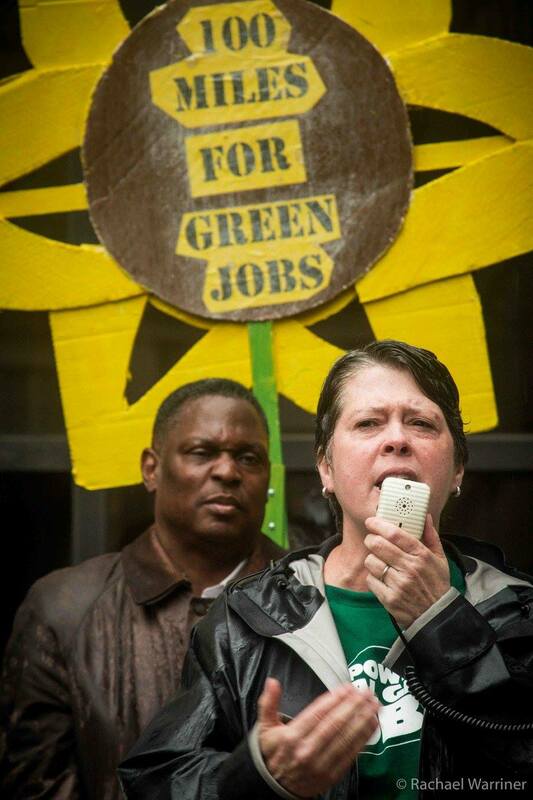 Along with our campaign parter POWER, we have pushed our local utility, PECO, to increase its commitment to local solar–though we still have a long way to go to get them to our goal of 20% solar by 2025, with a commitment to equitable access to solar energy and job creation in the neighborhoods that need them most. I am excited to share the lessons I’ve learned through my own experience, as well as what I’ve learned listening to and reading stories from a variety of social change movements. I’m especially excited to help you step into your own power as you work for a more just, sustainable, and loving world. What if I can’t make every class? No problem. Each class is recorded, and I usually send out the recording within 24 hours. How does an online course work? What equipment do I need? We will be using the Zoom platform, which is really cool and pretty simple to use. Each week I’ll send out a link, and you can join the group through a computer, tablet, or smart phone. Most devices today come with everything you need, but if you are using an older device and want to test it or your Internet connection, you can do that here. You can also call in from an old fashioned landline, but you’ll miss the class visuals. What is nonviolent direct action? There are different definitions, but my favorite is the simplest: it is action that is nonviolent but which puts direct pressure on the decision makers you’re trying to influence. It goes beyond letter writing, phone calls, and other tactics typically encouraged by institutions and shakes things up by actually challenging the status quo. Think of Gandhi, walking to the sea to take salt from the ocean in defiance of the British Empire, which controlled the salt trade. For a fuller definition and more examples, see this piece by Daniel Hunter. How many people do we need to make a group? And how do we register as a group? If you have six people, the group rate for this course will be less expensive than the individual rate. Obviously, the more people you recruit, the less it will cost per person. When you are ready to register, please fill out the registration form and make one payment on behalf of the group. (You all can figure out how to divide the cost among you.) I will send you another form to collect the names of everyone participating (up to a maximum of twenty), so that each participant can have access to all the materials of the course. If you are getting financial support from your faith community or some other organization and need to wait for that to come through, or if you would rather send a check, please send me a message through my site contact page, and we’ll work it out. What if I don’t have a group, or we only have a few people? You can certainly take this course as an individual or with a few friends. In fact, understanding direct action campaigns may help you see what kind of group you’d like to form or join. That said, nonviolent direct action is a team sport, so you’ll need a group to carry out the kinds of tactics we’ll be discussing. If you are thinking of rounding up some folks, check out this article by George Lakey about what kinds of skills are needed in a campaign. I want to make the empowering material in this course available to as many people as possible. If you are an individual for whom cost is a barrier, please click here to apply for financial aid. Whether you are an individual or a group, you may have resources in your community that can support you, which will also help your community become more invested in what you’re doing. Groups in particular might consider doing a Kickstarter campaign or other type of fundraising event, both to defray the cost of the class and to help you identify future potential supporters.